You can use both polar coordinates and Cartesian (x, y) coordinates (also known as rectangular coordinates) at any time to describe the same location on the coordinate plane. Sometimes you’ll have an easier time using one form, and for this reason it’s important to know how to change between the two. 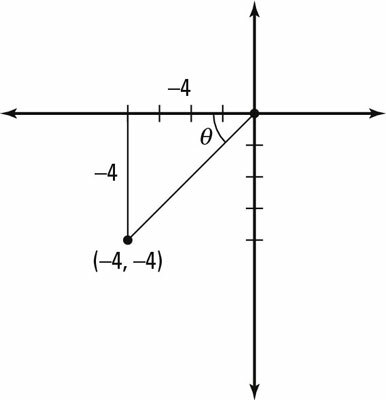 Cartesian coordinates are much better suited for graphs of straight lines or simple curves. Polar coordinates can yield you a variety of pretty, very complex graphs that you can’t plot with Cartesian coordinates. You may choose, however, to leave your angle measures in degrees, which is fine as long as your calculator is in the right mode. A polar and (x, y) coordinate mapped in the same plane. coordinates, allowing you to see the relationship between them. x, and y? Look at how they’re labeled on the graph — all parts of the same triangle! in the first or fourth quadrant. You need to look at your x- and y-coordinates and decide whether that placement is actually correct for the problem at hand. Your calculator doesn’t look for tangent possibilities in the second and third quadrants, but that doesn’t mean you don’t have to! which means that y = 1. Express the values from Steps 1 and 2 as a coordinate point. is the answer as a point. 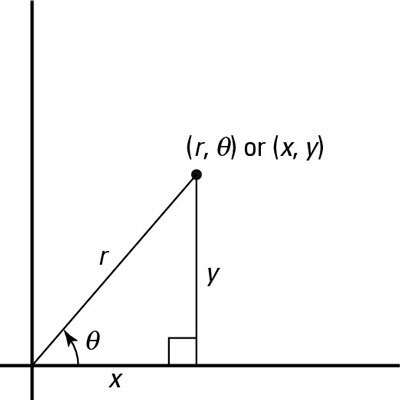 Plot the (x, y) point first. An (x, y) coordinate changed to a polar coordinate. This figure shows the location of the point in quadrant III. Express the values of Steps 2 and 3 as a polar coordinate.